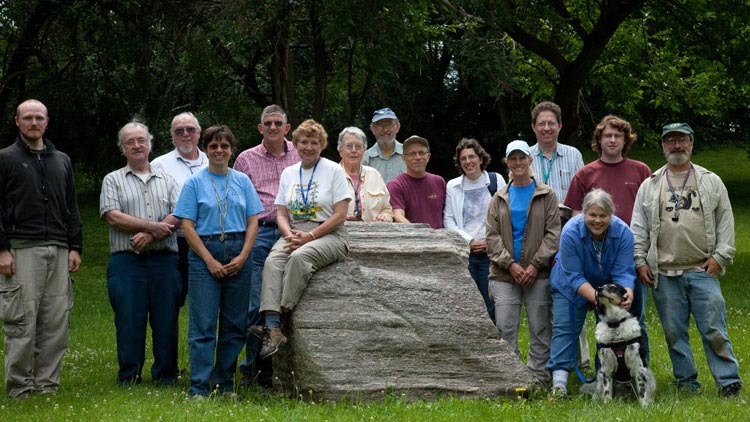 The summer 2009 foray of the Ohio Moss and Lichen Association, organized by Barb Andreas and Ray Showman, was conducted at three separate preserves in Darke County. 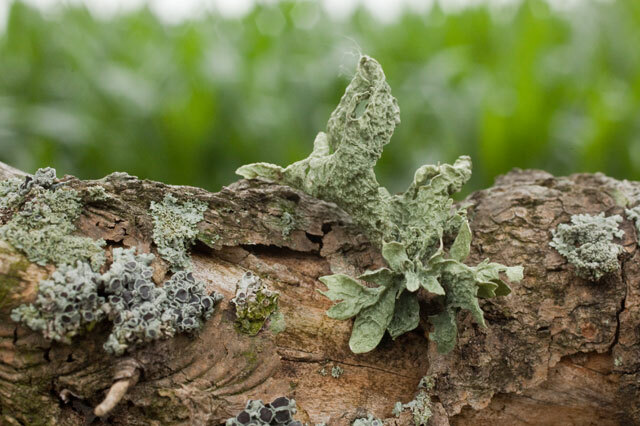 Like many of the agriculture-dominated counties of extreme western Ohio, few bryophytes and lichen records existed prior to our investigations there. There were only 8 mosses and 11 macrolichens reported from Darke County! The foray was attended by 15 people and one dog, including two participants (three, if you include the dog) who were new to our group. OMLA Summer Foray, Darke County, Ohio. July 18, 2009. Collecting began at the Routzong Preserve, a county park located at the corner of St. Rt. 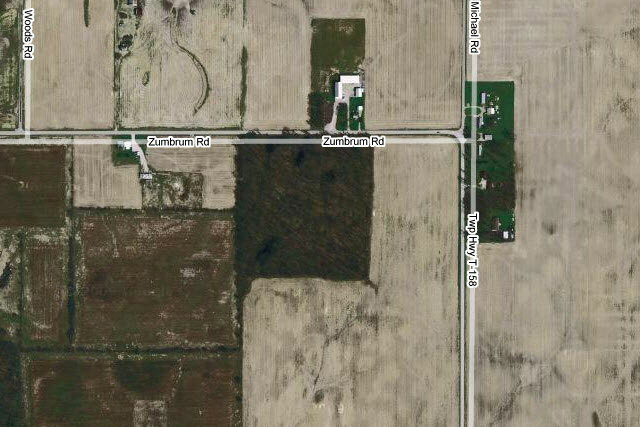 571 and Routzong Rd. This is a 55-acre swamp forest with about 1.5 miles of trails. Here’s an aerial view of the preserve. 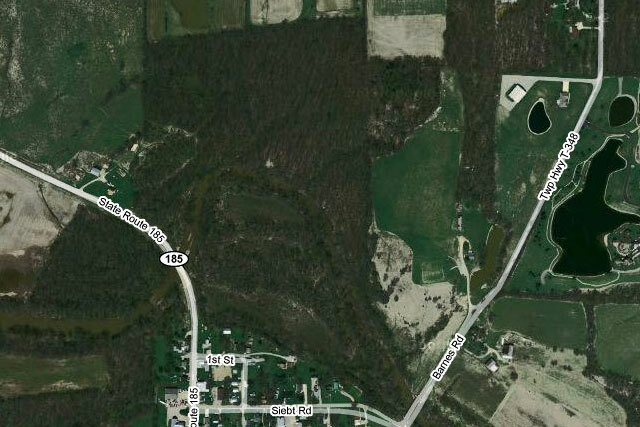 Note how the preserve is a wooded “island” in a an agricultural sea. 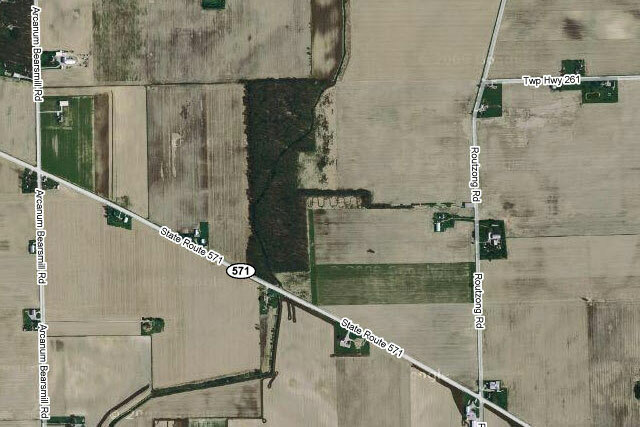 Aerial view of Routzong Preserve, Darle County, Ohio. Here’s a ground-level view of Routzong Preserve. Ground-level view of Routzong Preserve. July 18, 2009. One of the afternoon collecting locations was Bald Knob, an area where The Nature Conservancy holds a conservation easement. Aerial view of Bald Knob, Darke County, Ohio. 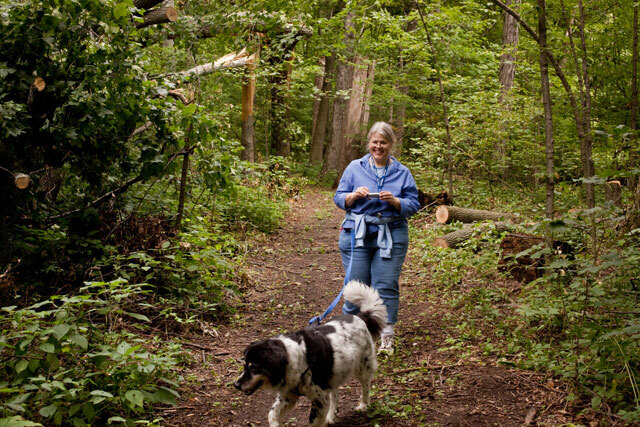 An alternate afternoon location was Drew Woods, 15-acre ODNR State Nature Preserve. Here’s an aerial view of Drew Woods. Drew Woods State Nature Preserve, Darke County, Ohio. 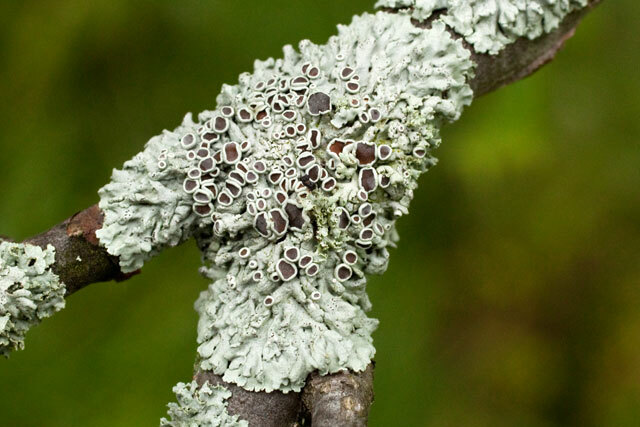 On the foray we found one new state record macrolichen, one state rarity and a number of new county records. 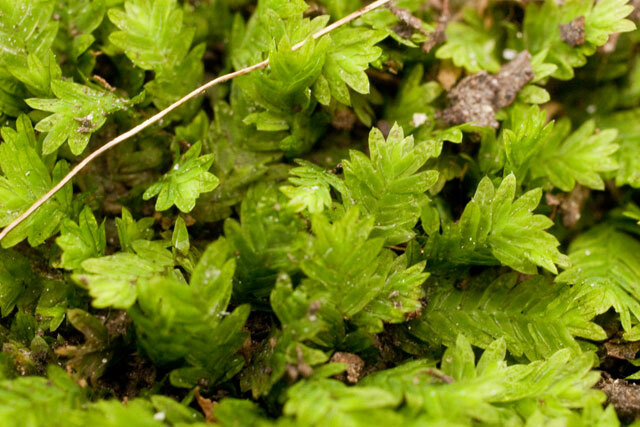 Bryophyte records are still being compiled. Details will appear in the 2009 OBELISK in December. 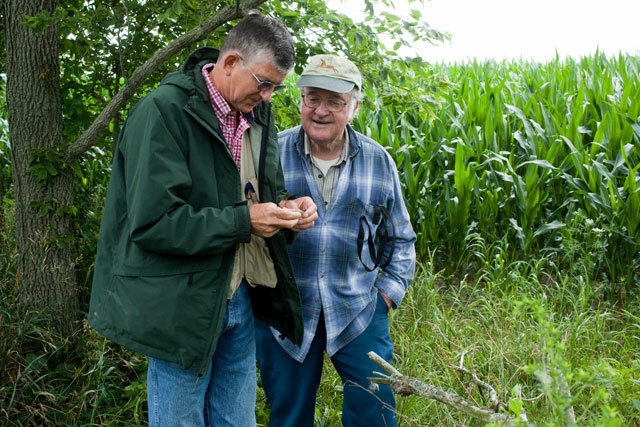 Ray and Dave examine a macrolichen at Routzong Preserve, Darke County, Ohio. Macrolichen at Routzong Preserve. July 18, 2009. Acrocarpous moss at Routzong Preserve. July 18, 2009. 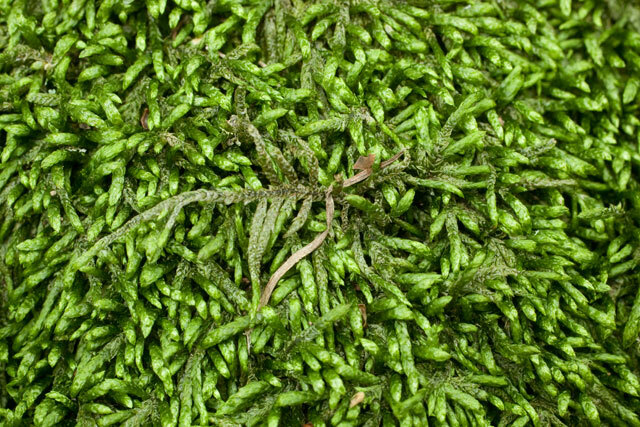 Pleurocarpous moss at Routzong Preserve. July 18, 2009. 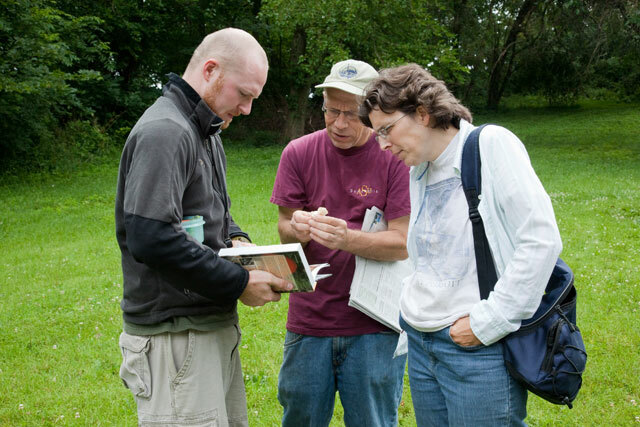 Moss enthusiasts John, Bill, and Carole at OMLA Summer Foray. July 18, 2009. Although OMLA forays focus on cryptogams, it was a pleasure to see a few plants blooming at a time of the year when there aren’t very many wildflowers evident. 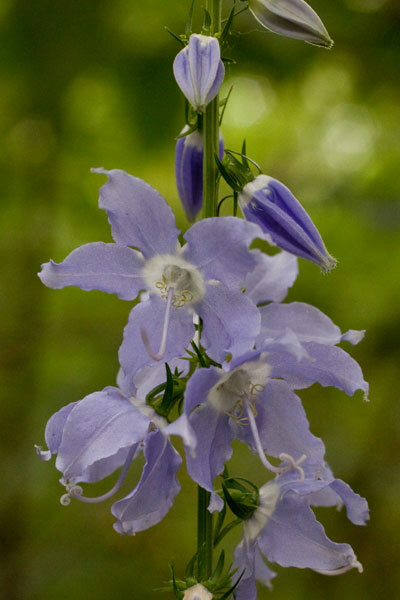 Tall bellflower (Campanula americana) at Routzong Preserve. Darke County, July 18, 2009. 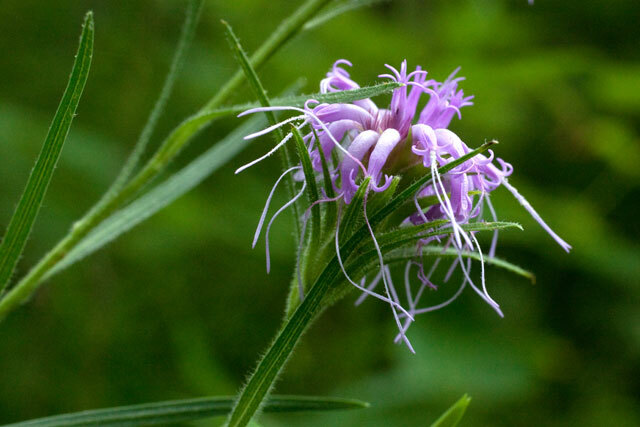 Scaly blazing-star (Liatris squarrosa) at Bald Knob. July 18, 2009. For a full list of all moss and lichen species recorded from this one-day foray, please check out the upcoming issue of the Obelisk. Descriptions of future forays can also be viewed on the OMLA website’s Upcoming Forays page.